Squish, shape, smash, and sculpt all kinds of different creations with 20 different Play-Doh colors in large 3-ounce cans. Great for parties, classrooms, play-dates, or anytime creative fun!Hasbro, Play-Doh and all related terms are trademarks of Hasbro. 6 colors of Play-Doh Sparkle Compound. Make bright and shiny creations with Play-Doh Sparkle Compound. Includes 2 cutters to make your creations. "Your Play-Doh creations will be bright and sparkly with the Sparkle Compound collection! You get 6 colors of shiny, twinkly Sparkle Compound and 2 cutters to make flowers, gems or other beauties. The only limit to your artistry is your own imagination! Play-Doh and all related characters are trademarks of Hasbro. " 20 pieces and 5 Play-Doh colors for lots of open-ended creative fun. Reusable plastic tub makes it easy to store everything for next time. Includes storage tub, 2-piece extruder with rail, 3 stampers, roller, knife, 12 cutters, and 5 cans of Play-Doh Brand Modeling Compound. Convenient creativity kit for on-the-go Play-Doh fun. Features 9 classic tools and 4 Play-Doh colors. Reusable tote keeps all the pieces together for storage or travel. 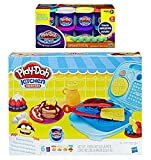 Includes storage tote, 4 shape cutters, roller, scissors, plastic knife, rolling cutter, embossing tool, and 4 cans of Play-Doh Brand Modeling Compound..
Everything you need to feel like you're in a real cookie bakery. Includes 4 cutters to create circle, square, star and heart-shaped Play-Doh cookies. Textured rolling pin lets you add fun patterns. Press pretend frosting with the extruder and create make-believe sandwich cookies. Includes tray, roller, 2-Piece extruder, 4 cutters, spatula and 5 cans of Play-Doh brand Modeling compound. 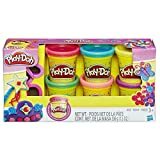 Gives ability to add awesome details to Play-Doh creations with this big 8-pack of Play-Doh Plus compound! Little hands can make more detailed yellow swirls, pink stars or other imaginative additions with this softer, smoother Play-Doh Plus compound! Includes 8 one-ounce cans of Play-Doh Plus compound. Pack includes 8 cans of Play-Doh Plus compound! Softer and smoother! Create awesome details! Ages 2 and up. Fun to play with, but not to eat. NOTICE TO PARENTS: CONTAINS WHEAT. NONTOXIC. CONFORMS TO ASTM D-4236. See Play-Doh foods "bake" in the electronic Magical Oven. 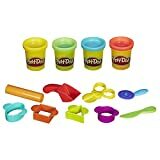 Load pretend food and Play-Doh compound, then press the lever. White light changes to red and oven makes Ding! sound when done "baking". Make pretend foods like make-believe muffins, play pizzas, and crazy cakes. Compound not intended to be eaten. Play-Doh play lets kids take the lid off their imaginations and explore their creativity. Can packs and basic tool sets offer all kinds of open-ended play. Create all kinds of Play-Doh frozen desserts. Includes stand for displaying creations. Top with silly sprinkles and crazy candy stamps. Creation cards feature step-by-step how-tos to make even more Play-Doh treats. 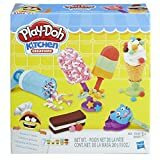 Includes sprinkle crank, ice pop book-mold, 2 cones, 2 cookie stampers, 4 sticks, push ice pop mold, whipped cream tool with rail, textured roller, cat stamper, 2 stands, 2 creation cards, and 7 cans of Play-Doh Brand Modeling Compound (net weight 10 ounces/280 grams). 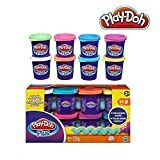 Ages 3 years and up..
Play-Doh Rainbow Starter Pack 16oz. The picture is for illustrated purposes, we should have the latest version of the product in stock. Have a Play-Doh breakfast bonanza with colorful pretend foods. • Waffle maker also creates pretend pancakes, imaginary toast, and more..
Add silly syrup or fluffy Play-Doh Plus whipped cream with the syrup bottle. Create lots of fantastical fruits and other toppings with the half-molds..
Show off the creations with the tongs, utensils, and plates..
Includes breakfast book-mold, 2 plates, 2 cutters, decorating tool, tongs, roller, fork, knife, 3 creation cards, 1 one-ounce can of Play-Doh Plus compound, 3 two-ounce and 2 one-ounce cans of Play-Doh Brand Modeling Compound (9 ounces total)..
You will also receive a 8 pack of Play-Doh Plus Modeling Compound totaling 8 oz..
Play-Doh breakfast time is the best way to start the day! Create the most colorful pretend breakfast menu imaginable with the waffle maker and accessories. Not only does the waffle maker shape both square and round Play-Doh waffles, it also creates imaginary toast, pretend pancakes, lots of make-believe toppings, and more. 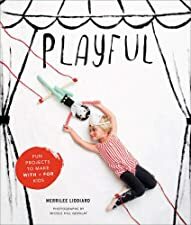 Use the syrup bottle to squeeze silly syrup or fluffy Play-Doh Plus whipped cream on top to complete the creations, then use the tongs, utensils, and plates to show them off. The 3 creation cards can help inspire your junior chef with more fun things to make. There's so much to create, Play-Doh breakfast time might even take up the whole day! Hasbro, Play-Doh and all related properties are trademarks of Hasbro. 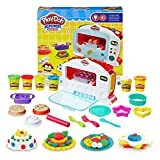 Play-Doh Sweet Shoppe Swirl And Scoop Ice Cream Playset. Shape and style Play-Doh characters that come to life in ways never imagined before! To start, simply download the Play-Doh Touch app, shape a Play-Doh creation and place it on the scan card, then scan it into the app with your smart device. The creation will come to life on screen ready to play! With the character stampers, create new friends that have unique personalities when scanned into the app. Shape and scan creations with the action stampers for fun hair effects: the blow dryer grows hair on the characters and the scissors give them fun hairstyles. Keep shaping and scanning more Play-Doh creations for more fun!Hasbro, Play-Doh and all related properties are trademarks of Hasbro.Apple and the Apple logo are trademarks of Apple Inc., registered in the U.S. and other countries. 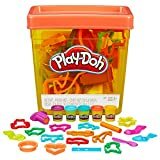 App Store is a service mark of Apple Inc.Google Play and Android are trademarks of Google Inc.
Let your imagination soar with this Play-Doh Top Wing toy! This toolset combines the fun of vehicle toys, creative Play-Doh play, and high-flying adventures with the cadets-in-training from the popular Nickelodeon TV series. The 4 rescue birds - Swift, Rod, Penny, and Brody - have been reimagined as Play-Doh stampers for kids to create their favorite cadets. Shape a 3D version of Brody inside his Splash Wing and roll fun patterns with the tires on Rod's Road Wing. Penny's Aqua Wing squeezes Play-Doh compound from the front, almost like a water cannon! Swift's Flash Wing doubles as a knife to slice through Play-Doh compound. Help the Top Wing Academy cadets earn their wings by making badges with the badge stamper. With 5 non-toxic Play-Doh colors in 2-ounce cans, imaginations are sure to take flight! Copyright 2018 9 Story Media Group Inc. All Rights Reserved. Top Wing and all related titles, logos and characters are trademarks of 9 Story Media Group Inc. Nickelodeon and Nick Jr. are trademarks of Viacom International Inc. Hasbro, Play-Doh, and all related properties are trademarks of Hasbro. Let your imagination soar with this Play-Doh Top Wing toy! This toolset combines the fun of vehicle toys, creative Play-Doh play, and high-flying adventures with the cadets-in-training from the popular Nickelodeon TV series. The 4 rescue birds -- Swift, Rod, Penny, and Brody -- have been reimagined as Play-Doh stampers for kids to create their favorite cadets. Shape a 3D version of Brody inside his Splash Wing and roll fun patterns with the tires on Rod's Road Wing. Penny's Aqua Wing squeezes Play-Doh compound from the front, almost like a water cannon! Swift's Flash Wing doubles as a knife to slice through Play-Doh compound. Help the Top Wing Academy cadets earn their wings by making badges with the badge stamper. With 5 non-toxic Play-Doh colors in 2-ounce cans, imaginations are sure to take flight!Copyright 2018 9 Story Media Group Inc. All Rights Reserved. Top Wing and all related titles, logos and characters are trademarks of 9 Story Media Group Inc. Nickelodeon and Nick Jr. are trademarks of Viacom International Inc.Hasbro, Play-Doh, and all related properties are trademarks of Hasbro.Notice to Parents: Contains Wheat. Non-Toxic. Conforms to: ASTM D-4236. Compound not intended to be eaten. 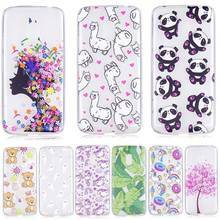 Product and colors will vary. To clean, allow to dry, then scrape or vacuum. Molded results vary depending on child's age and level of skill. Inspire growing minds and discover the benefits of Play-Doh play with the Numbers and Counting playset! Did you know that multi-sensory Play-Doh fun can help engage kids in the creative thinking process, which can also help encourage key foundational skills? Designed for kids ages 2 and up, the chunky stampers are great for little hands and feature friendly sea animals that make it fun to discover counting. With activities using these stampers and the double-sided playmats and number cards, you can help reinforce your child's sense of number identification, comparing and contrasting, and counting. All of this hands-on exploration can also help encourage their sensory-motor development, including fine motor skills! With the Together Time Guide, you can play an active role with guided activities to help you customize each experience for your child. It's always better to learn together!Hasbro, Play-Doh and all related properties are trademarks of Hasbro. 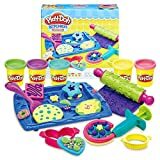 Discover and play the Play-Doh way! As kids begin to learn 123s, number toys can help encourage them to practice identification, pre-math, counting, and so much more. These activities can be so much more fun with squishy, colorful, non-toxic Play-Doh compound! With the 8 chunky, kid-friendly stampers, 2 double-sided playmats, 10 double-sided number cards, and 3 Play-Doh colors in this set, boys and girls ages 2 and up can engage in all sorts of number activities like matching, compare and contrast, and more. The parent guide is full of fun skill-building activities for toddlers and their families to explore together. Whether you need a rainy day activity, an arts and crafts activity for kids, or a birthday gift, imaginations are sure to shape up with this Play-Doh learning toy!Hasbro, Play-Doh, and all related properties are trademarks of Hasbro. Includes 8 stampers, 2 double-sided playmats, 10 cards, Parent Guide, and 3 cans of Play-Doh Brand Modeling Compound. Notice to Parents: Contains Wheat. Non-Toxic. Conforms to: ASTM D-4236. Compound not intended to be eaten. Product and colors will vary. To clean, allow to dry, then scrape or vacuum. Molded results vary depending on child’s age and level of skill. Play-Doh 15 Count Party Bag, 15 oz Share the fun and share the creativity with this Party Bag full of 15 cans of Play-Doh modeling compound. Featuring gift tags on the top of each one, these brightly colored cans are perfect for passing out to your friends at your next party. You can each mold cool things on your own or combine to create one giant, amazing creation! Moms are sure to love these, too, and grab one on-the-go to keep imaginative kids entertained anywhere. Bag contains 15 one-ounce cans of Play-Doh brand modeling compound. Hasbro, Play-Doh and all related terms are trademarks of Hasbro. 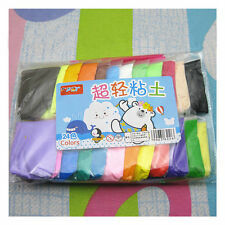 Bag full of 15 colorful cans of PLAY-DOH modeling compound is perfect for party favors and school gifts! Bag contains 15 one-ounce cans of PLAY-DOH brand modeling compound. Ages 2 and up.